NEW YORK New York State Senator Malcolm Smith and New York City Councilman Dan Halloran have been arrested as part of a plot to rig the New York City mayor's race. The FBI said the two were arrested early Tuesday at their homes. Smith, 56, "tried to bribe his way to a shot at Gracie Mansion", said U.S. Attorney Preet Bharara. 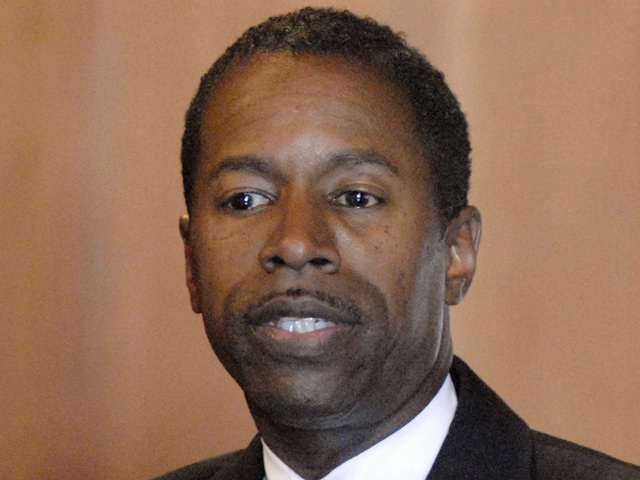 Bharara said Smith "drew up the game plan and Councilman Halloran essentially quarterbacked that drive by finding party chairmen who were wide open to receiving bribes." During the FBI investigation into the plot, an undercover FBI agent posed as a wealthy real estate developer and attended meetings with Smith. Smith allegedly tried to bribe leaders of Republican Party county committees around New York City in an attempt to run for mayor as a Republican. Smith was a registered Democrat. CBS 2 New York reported other charged people included: Bronx County Republican Party Chairman Joseph Savino, 45; Queens County Republican Party Vice Chairman Vincent Tabone, 46; Spring Valley Mayor Noramie Jasmin, 49; and Spring Valley Deputy Mayor Joseph Desmaret, 55. "The complaint describes an unappetizing smorgasbord of graft and greed involving six officials who together built a corridor of corruption stretching from Queens and the Bronx to Rockland County and all the way up to Albany itself," said Bharara. Savino apparently wanted $25,000 "in an envelope" and Tabone wanted $50,000, according to the federal complaint. The two Republican leaders allegedly got an initial down payment for $40,000 and according to the federal complaint, Smith was so eager for success he said, "If you pull this off, you can have the house, I'll be the tenant." Is Anthony Weiner preparing for a comeback? In court papers, the FBI detailed meetings aimed at benefiting Smith that began in November and recounted numerous meetings among the defendants, the undercover FBI agent and the cooperating witness, who pleaded guilty to federal charges last month in a deal aimed at winning leniency at sentencing. In a Jan. 25 meeting in Smith's car in Rockland County, the cooperating witness told Smith that buying the help of Republican county committee leaders would cost "a pretty penny" and asked if it's "worth any price," the complaint said. The FBI said Smith responded: "Look, talk to me before you close it. But it's worth it. Because you know how big a deal it is." FBI Assistant Director George Venizelos said the defendants betrayed the law and the people. "Public service is not supposed to be a shortcut to self-enrichment," Venizelos said in a statement. "As alleged, these defendants did not obey the law; they broke the law and the public trust. There is a price to pay for that kind of betrayal." Smith and Halloran could each face up to 45 years in prison. Smith's spokesman Todd Shapiro said in a statement that the Senator has "record of 13 years of dedication, hard work and integrity to the people he serves in Queens." "He will be vindicated when the all the facts in the case are revealed."